For many retailers, a successful Christmas is the difference between an average year and a good year. And every year, without fail Christmas creeps up on us. We hope you’ve already started planning your gift offering, but if you haven’t – here’s a guide that will hopefully help you maximise every opportunity over the festive season. Our recently launched Christmas is Coming brochure is full of inspiration, top tips and combined with our guide to shopping with WBC this Christmas, gives you all the tools needed for a successful Christmas. Just remember to keep things simple, and don’t be shy to make good margins. Every consumer is in prime shopping mode, so work out your price points and start selling. 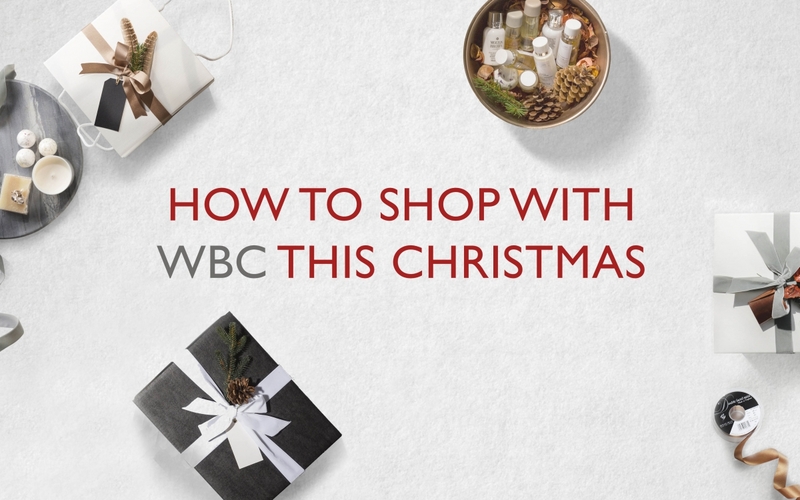 Here’s our handy guide to ordering with WBC this Christmas, including deadlines and last order dates. Any questions we haven’t thought of, tweet us, Facebook us, email us, or phone us on 08000 85 85 95. We’re here to help! Find essential information about products online, like how much shred to use in your Christmas hamper, as well as box sizes and pack quantities. You’ll also find how to guides, additional information and inspiration on our social channels and the blog. Using the zoom functions on our website will help you see product quality, finish and detail. If you still want to see a sample, call us on 08000 85 85 95 and we’ll be happy to organise them – allow 3 to 4 days for delivery. We are unable to offer samples on some products*, contact our Customer Service team for further information. To keep our service at lightning speed, your order is taken on screen and immediately transferred to the warehouse for picking and packing. It’s then loaded onto trailers which leave as soon as they’re full, making it difficult to stop it, add to it, or change it. Don’t worry if you’ve forgotten something off your order, call us and we’ll do our best to help you. Make sure your order is sent to a manned delivery address. We would love to be able to offer you guaranteed timed delivery slots, but as this is a business to business courier account, deliveries are made during office hours 9am & 6pm. Of course you can! But this needs to be arranged with our sales team in advance. Contact our office on 020 7737 9516 so we can provide you with the correct collection details. Overprinting stock product goes into overdrive at Christmas. If you’ve yet to try branding our products with a company logo, it can be a great way to boost sales by offering corporate gifting to local businesses. The last order date for branding for delivery before Christmas is Monday 10th December. If you miss this date, give us a call and we’ll always try and squeeze you in! Ordering online at wbc.co.uk is quick, efficient and secure all day, every day. Simply register or login to ensure you have access to all our ‘Trade User’ benefits and prices. As a trade supplier our minimum order is £75.00 ex VAT. Orders are payable using Visa, Mastercard, Amex or Bank transfer and must be paid in full before despatch. Payment is accepted in sterling or euros, exchange rates are subject to weekly change. Application for a 30 day sterling or euro credit account is available by request, minimum spend £500 ex. VAT per annum to open/ maintain account facilities. All invoices are sent via email. 95% of our parcels are delivered on a next day service, but the busiest time of year can thwart even our best intentions. For the swiftest possible delivery, ensure you place your order before 2pm (earlier if possible) so we can aim to despatch the same day. Then leave yourself a 48 hour window for delivery, and you’ll never be disappointed. Larger orders are automatically sent out on pallets, so please let us know if you cannot receive pallets or have any delivery restrictions. Please contact our sales team regarding international deliveries.